In a late night phone conversation, Joe Vitolo told me about this wonderful oblique pencil he had made from a Bullock penholder and an Alvin compass head. Suddenly, flashes of practicing a complicated flourish before pen and ink hit the paper or sitting in an airport where ink is impractical (a nib probably wouldn’t get on the plane anyway) soar through my imagination. Then quickly, the brain shoves this into the “Why didn’t I think of that?” file. I’ve got to build me one of those! Joe talked to IAMPETH member Neil McCaffery, owner of a machine shop in Ellinwood, Kansas, who had the same notion. Francis Smith, husband of brand new IAMPETH member, Mary Lou Smith of Mobile, Alabama, also de cided to try his hand at an oblique pencil. In no time, this group produced several designs that anyone could easily build. Neil McCaffery took a Peerless holder and inserted a piece of steel tubing reamed to the necessary inside diameter to accept the compass lead. Small cuts were made at the tip for expansion and to better hold the lead. Lead is advanced with a toothpick pushed into the back end. 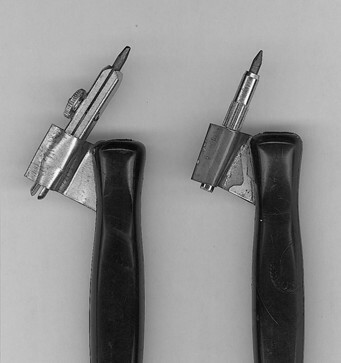 Francis Smith was the only one to make an oblique pencil completely from scratch. 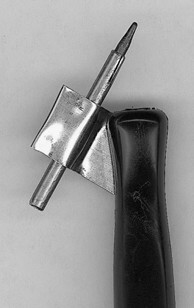 He carved the handle and fash ioned a flange from copper to fit the C-thru compass head. This pencil has the advantage of being able to hold thinner lead. However, Joe, Neil and Francis are experienced wood and metal workers able to work wonders with tools. Yours truly is what can best be described as a techno-muggle. I’ll refinish a table, but don’t ask me to build one. Left is my first attempt at an oblique pencil. The head is bulky and heavy. By the time you read this, the head will be back on a compass and the holder will hold nibs again. The model at right using the Helix head was lighter and much easier to use. My first attempt at a pencil pictured above, right, used a Peerless holder and another style of Alvin compass head available at Staples (You’ll have to buy the whole compass and remove the head--about $4.50). Peerless holders are great because they are plastic and inexpensive with a brass flange that may be easily reshaped. While this pencil was a success, the head was too heavy and bulky to be comfortable. It was easy enough to make. Using successively larger screwdrivers, I spread the flange until it was just far apart to accept the compass head. Gently, but firmly working the head into the malleable brass, it fit snugly with a pinch from needle nosed pliers along the outside edge. Attempt number two was much better. This time, a Helix compass head was used (Office Max: $4.29). It is lighter, thinner and much more comfortable. It is also longer; a little over half an inch had to be cut from the back end of the shaft. It is chrome plated brass and cuts very easily with a hacksaw. Turn the nut above the lead and pull the lead forward to advance or change it. The Helix head was inserted the same way as the Alvin head. 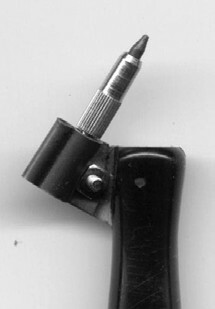 A Helix pencil in a PIA Adjustable Oblique Holder allows one to affix the head of the pencil into the flange without having to alter the flange in any way. The pencil fits into the round slot (see inset). It may be necessary to put a layer of masking tape around the pencil to make it fit securely. 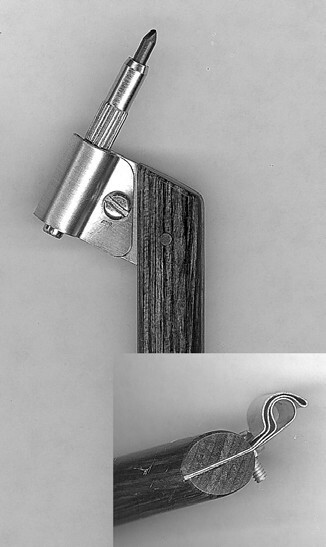 The PIA Adjustable Oblique Holder is available at Paper and Ink Arts, 1-800-736-7772, www.paperinkarts.com.